“Cynthia Holiday… All The Way” spotlights Cynthia giving her own personal touch to straight-ahead jazz, blues, pop standards and introducing some originals. 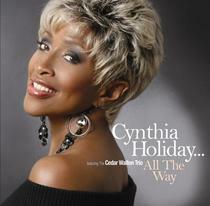 In fact, she co-wrote two of the tunes with Radam Schwartz, “I Like What I See” and “You’ve Got A Job To Do.” When asked to pick out a few favorite selections on the CD, Cynthia says, “My Little Rainbow” is a lovely ballad along with “Samba de Amore” which is a light samba. I Like What I See Recorded live at Birdland New York City with drummer Winard Harper as guest artist. "I Like What I See" is also the title of the song with lyrics written by Cynthia Holiday and music by Radam Schwartz. It's a story about "Girls night out looking for Mr.Right." You'll love her story.